We stayed 4 nights at this unique resort situated 20 minutes walking from Mango Beach. It's a place with the service of a guesthouse and the cosiness of a homestay. It has a great atmosphere where you can spend the day reading a book in one of the many hammocks or have a chat with fellow travelers in a kind of outside 'living room' on stilts. The bungalows are basic with a bed, a musquito net and a fan. The shared or private bathroom consists of a coconutshower with cold water, a toilet and a sink. All made of natural products. The best of all is the food, which is served whenever you like. At night the multilingual owner/chef - Peter - is dedicated to serve a variety of absolutely delicious dishes which can easily be compared to high quality restaurants. Last but not least the owner can help you with any kind of traveling service and things to see & do on the island (e.g. visa, transportation, motorbike rental, boat trips, etc.). Peter, thanks for a wonderful time at Freedomland! Beautiful place, excellent food, very nice people!!!! Visited with my wife and a five-year-daughter this time and we are willing to visit again. 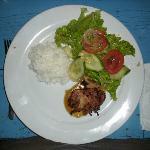 Great people, the atmosphere, the best dinner in our trip to Vietnam, the relaxing bungalows, Rita cafe table. Peter and Rita, you have a greate taste for everything. My partner and I found Freedomland using tripadvisor and as yet this little piece of hippy paradise is not in Lonely planet or the rough Guide. 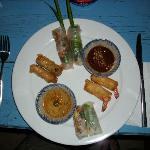 It still retains it's charm and quality and I for one hope it stay's as one of Phu Quoc's best kept secrets. Peter is the life and soul of this establishment, this is a homestay with a communal feeling about it and Peter does go out of his way to make you feel at home. I think though that he grapples with the business v's home aspects of this as there were times when we felt that he struggled with what kind of a service he was providing. The place has only been open two years and so many things are still being decided. with the only slight negative over, I will swiftly move onto the positives...Many customers have already mentioned the food, but this really was the highlight for me. I enjoyed eating Peter's hearty meals, which he so obviously takes much pride in presenting. He prepares so much and with communal dining, really makes you feel that you are in his back garden, dining with friends. I loved this aspect of our stay. The rooms are basic but clean and well equipt for what you need (mossi net, en suite bathroom, though not all rooms have this) Our bathroom backed onto the lush jungle and I for one enjoyed cold showers after hot hot days in the sun. Peter was a wonderful host, he took six of us out on a fishing trip and ensured that we had a thoroughly enjoyable experience...This was a highlight for me and my partner and we thank Peter for his hospitality and fun nature. The staff too are wonderful, kind and always accomodating, something we missed in Vietnam. Lastly after some grappling, peter allowed my partner to watch the football on the internet. This meant moving the computer outside so that he could watch it at 2.30am. Though Peter didn't like the idea, he provided the service and so my partner was able to watch the match with the resident Mossi's, crickets and other wild animals...Nice! We would like to thank Peter for this, who I'm sure saw the funny side of it the next morning. We would recommend this place only to those people we feel would appreciate it and further more, to those we feel would compliiment it's charm and uniqueness.